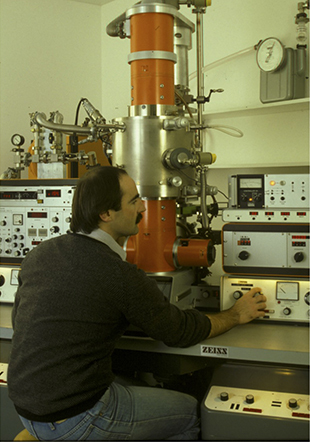 In the late 1970s, water was the bane of the microscopist’s existence. Since water doesn’t stay put under the powerful vacuum of an electron microscope, trying to image a live cell—plump with water—resulted in a vacuum-dried, shriveled mass. The best option at the time was to dehydrate a cell in advance and fix it with chemicals and resins to preserve some semblance of its lifelike shape. But there was one other tantalising option to image a cell that didn’t require drying it out: lock the cell’s water in place by freezing it. Still in its infancy, this solution also posed its own problems. In order to use an electron microscope to see a frozen cell from, say, a thin slice of rat kidney or human liver meant trying to make out its critical structures—swirls of cytoskeleton strands, rippled hillocks of reticulum—despite the black spots of ice crystals that the electrons in the microscope can’t penetrate. In the worst case, when the frozen water turned particularly vicious, ice crystals would spear the cell from the inside, causing it to burst. 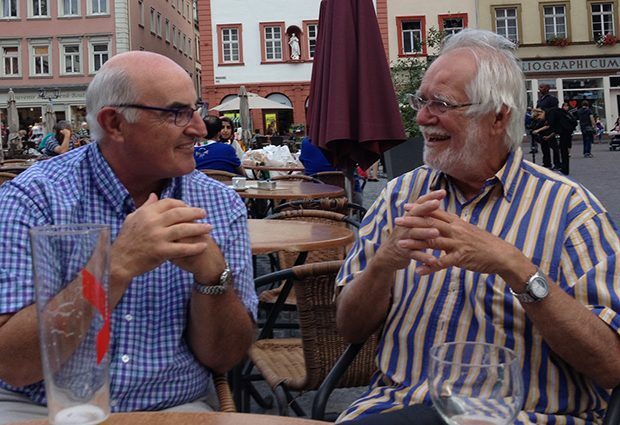 In 1978, the dream of EMBL group leader Jacques Dubochet was to freeze water so fast that crystals couldn’t form. The water would become vitrified—glasslike—allowing researchers to see cells as they had been in their living state using an electron microscope. For Alasdair McDowall, a Scot and self-described nomad who worked as Dubochet’s research technician, this project was a departure from the type of histopathology work he’d done before. The path to vitrification, though, was uncertain. Initially, Dubochet’s group thought the speed at which they cooled the sample would be important. McDowall helped to rig up a device that shot samples into a frigid bath of liquid nitrogen. They also tried minimising the size of the sample, reasoning that a smaller sample might freeze fast enough to beat crystal formation. After trying to vitrify tiny droplets, they figured even those might be too big, so they tried spraying the sample onto a grid in order to get an ultrathin layer of cells. They experimented with using different cryogens— liquid nitrogen slush, freons and propanes, ethanes and all sorts of ethylenes— and cryoprotectants to shield the cells from damaging ice crystals. After each shift in technique, McDowall peered at the latest sample in a microscope, hoping to see an improvement. “Mainly, what we saw was useless,” he says, smiling. Then one afternoon in 1980, after plunging a sample into ethane, a cryogen they hadn’t yet tried, Alasdair McDowall peered at a grid under a microscope and saw something strange: diffuse, round drops. He called over his lab head, Jacques Dubochet, to have a look. But Dubochet hadn’t seen the structureless splotches before either, so he bombarded the sample with electrons to determine whether or not it had a crystal structure using a process called diffraction. In the image produced by the diffraction, he expected to see a regular pattern of concentric circles, indicating the substance was crystallised. This is it, this is the one! But the lines he saw were fuzzy. Dubochet lept from his chair, said something in French (which McDowall didn’t understand) and ran through the lab. Although Dubochet’s next declaration was in English—“This is it, this is the one!”—McDowall already understood that they had finally succeeded in outpacing the ice crystals. The mysterious substance was the vitrified water they’d spent two years chasing. Since then, the field of cryo-electron microscopy has, in McDowall’s words, “gone ballistic”. Further developments have made it possible to image single particles, which has allowed researchers to better understand the structure of viruses such as Zika and Ebola, as well as the Tau protein, implicated in Alzehimer’s disease. For his contribution to sample preparation for cryo-electron microscopy, Dubochet has been awarded the Nobel Prize in Chemistry while McDowall, now equipped with a doctorate, is in the process of setting up his third cryo-electron microscopy lab—this latest one at Caltech. But despite all the changes to cryoelectron microscopy over the years—improvements in cameras and computers and the increasing use of robots to image samples—McDowall notes one constant.